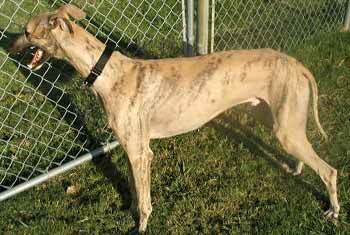 Jimmy is a light brindle male about 18 months old found as a stray in South Dallas. 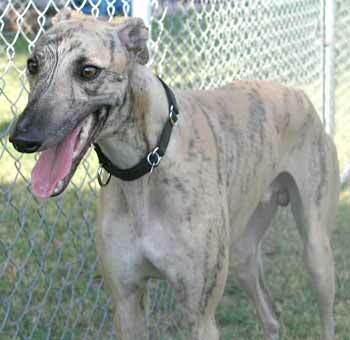 We will never know his history, as he is another grey who is double tattooed, making him untraceable. Jimmy is a young "little boy", who is very, very affectionate and inquisitive....he doesn't miss a thing! He is soaking in a lot of TLC right now, which not only does he need, but also deserves. Jimmy is named after the man who found him (James Scott) and who called the NGA and TGA, who then referred him to us. 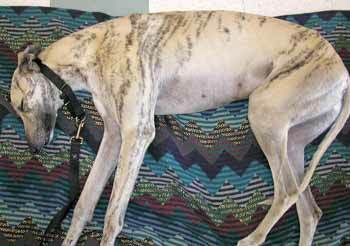 Jimmy is one precious little greyhound boy--he makes you smile just to look at him. He loves to run, and smiles ear to ear when doing so--he's good for a couple of sprints and then it's time to nuzzle and play with his stuffed toys. He is still a little puppy and likes his one-on-one attention, being brushed and even shares a quick kiss now and then. Jimmy would be perfectly at home with a buddy (two or four legged) so he has someone to call his own. Jimmy is not cat tolerant. Jimmy is being obedience trained four days a week, and loves to sit and heel--still working on the stay part! He wants to please you, and is food motivated, so training him is not difficult. One thing that makes Jimmy unusual, besides being so cute, is that his coat on his right side is brindle and his left side is solid fawn! Jimmy's foster home reports that he is "doing well; doesn't mind his crate during the day and then sleeps in the bedroom on his bed at night. He enjoys walks and retrieving a bone for hours (ok maybe not hours but for a long time). Jimmy loves to sit, fetch the ball, retrieve and sit again. He has a wonderful sweet disposition and gets along well with the children" (8 and 11 year olds).